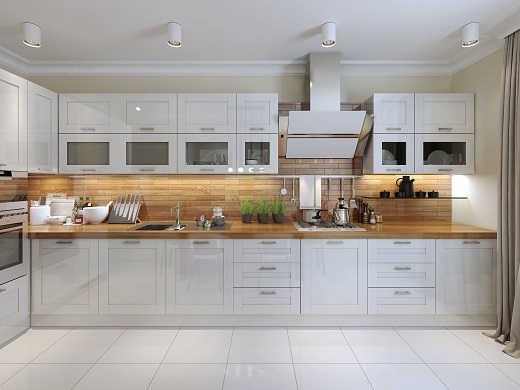 When looking at popular flooring options for kitchen remodels in Tulsa, it would be hard to not talk about tile. Cleaning tile is incredibly easy and it doesn’t warp or get mildew when wet like some other flooring types. For this reason, many will use ceramic tile, porcelain tile or stone tile in their kitchen for a designer touch and easy maintenance. Vinyl serves as an inexpensive, yet versatile flooring option for many homeowners across Tulsa. Vinyl flooring can often be made to look like tile flooring while retaining much-needed water and dirt resistance for kitchen applications. Vinyl flooring can come in a wide variety of colors and styles to match the needs of each individual kitchen remodel. Wood laminate has become one of the more popular flooring options in recent years because it can be manufactured to retain the appearance of a wooden floor without requiring the excessive maintenance of traditional wood flooring. Unlike traditional wood flooring, wood laminate is less prone to moisture and visible scratches. The development of locking mechanisms between flooring panels has made installation easier than ever. Bamboo flooring has become more well-known in recent years because of its similar appearance to and the ability to be sanded and refinished much easier than traditional hardwood flooring. If this flooring type becomes damaged or discolored, it can be sanded and refinished to restore its original beauty. 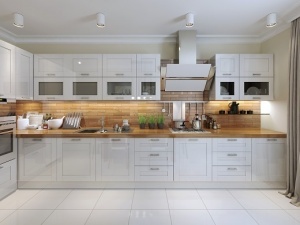 These factors have made bamboo a modern flooring option for kitchen remodels. Previous Previous post: What are Formica Countertops?